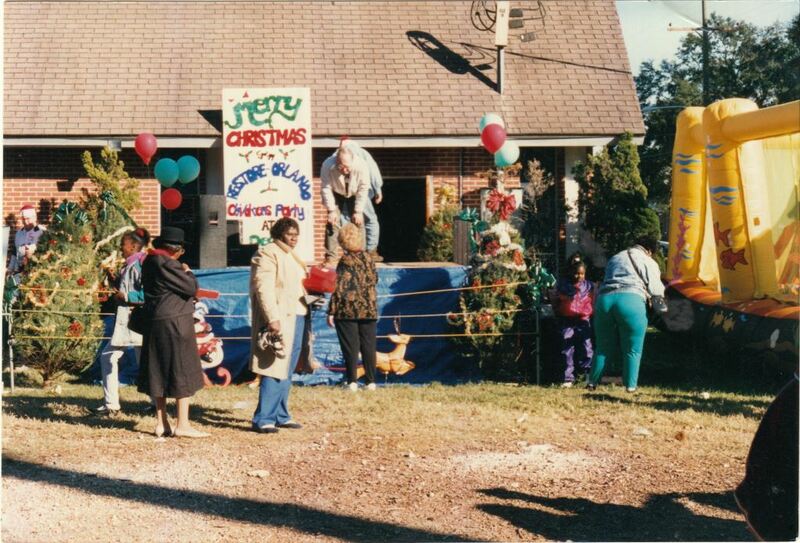 The Christmas party at Restore Orlando in 1996. The annual party features Christmas trees, decorations and a bounce house. 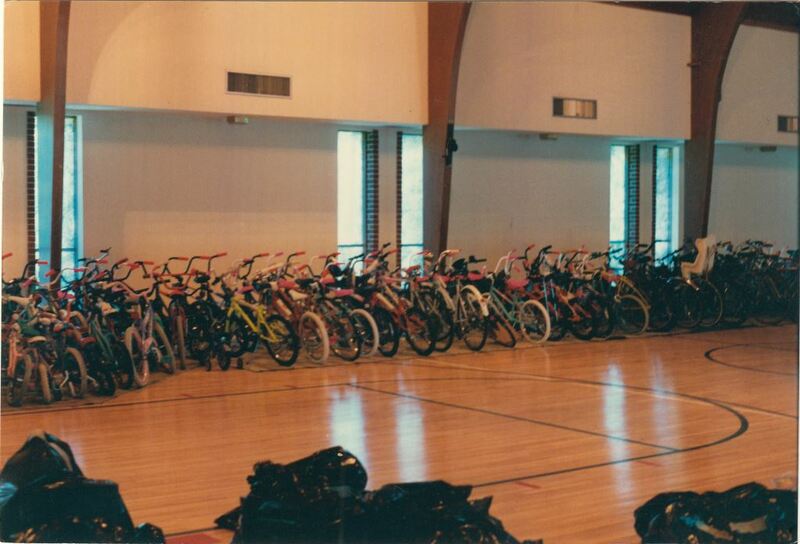 Members of the Orlando Magic, K-Mart, and other boosters often donated gifts, such as bicycles and bags of toys. Presents were unwrapped, so parents could be involved in the acquisition and wrapping of the gifts. 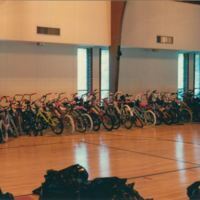 The second photograph shows bicycles that were given away as gifts at the party. Created by Jerry Applebee and Polly Applebee in 1994, the Restore Orlando's after-school program organized outings such as horseback riding and helicopter rides. The Applebees were affiliated with the Church of the Nazarene in the Parramore neighborhood of Downtown Orlando, Florida. Dedra Jenkins fought to have a basketball court built for the older children at Kaley Square Park across the street. Originally, owners of the church and park did not want a court because they feared it would be a place where drug dealers would congregate. This photograph, taken by an unknown volunteer at the program, was originally discarded, along with other similar photographs, and then found by a local resident near the Emmanuel Fellowship and Worship Center, which is located at the former site of Restore Orlando. The collection was given to the contributor, Dedra Jenkins. Original 3 x 5 inch color photographs, December 1996: Private Collection of Dedra Jenkins. Digital reproduction of original 3 x 5 inch color photographs, December 1996. Parramore Collection, Orlando Collection, Orange County Collection, RICHES of Central Florida. Originally owned by Dedra Jenkins. Copyright to this resource is held by Dedra Jenkins and is provided here by RICHES of Central Florida for educational purposes only. Thompson, Geraldine Fortenberry. Orlando Florida. Charleston, SC: Arcadia, 2003. "Carver Park: An Orlando Housing Authority HOPE VI Community." Orlando Housing Authority. Accessed 13 April 2016. http://www.orl-oha.org/carver_park_update.htm. Shanklin, Mary. "Grand Opening of Carver Park." The Orlando Sentinel, September 12, 2009. Accessed 13 April 2016. http://articles.orlandosentinel.com/2009-09-12/news/0909110187_1_carver-park-carver-court-downtown-orlando. 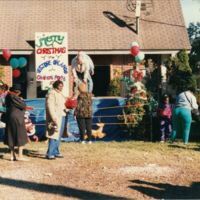 “Christmas Party at Restore Orlando, 1996.” RICHES of Central Florida accessed April 22, 2019, https://richesmi.cah.ucf.edu/omeka/items/show/7781.